A wonderful introduction to the splendour of the range of classic Himalayan culture, people and landscape. Driving through the Tibetan plateau you see the lushness of the foothills as well as the austerity of the high altitude desert. Vast open skies frame dramatic massifs of ice and stone against brown shot through with occasional green barley and blue water. There are temples and palace squares with art rich and varied beyond all imagination, and monasteries where the air, redolent with the odours of butter lamps and juniper incense, carries through the wind centuries of tradition. The fluttering prayer flags everywhere are the most obvious expression of the spirituality and faith that permeates every aspect of the lives of Tibetan Buddhists. In <?xml:namespace prefix = st1 ns = "urn:schemas-microsoft-com:office:smarttags" />Nepal, the cosmopolitan hisotyr of the Newars of Kathmandu Valley comes alive in the sophisticated palace squares. 01. Receive at the airport and transfer to the hotel. 02. Full day sightseeing of Baudhnatha/Pashupatinath and Bhaktapur,night at the hotel. 03. Full day sightseeing of Kathmandou Durbar square,monkey temple and Patan Durbar Square,night at hotel. 04 Kat-Zhangmu (2,500m) :123 Km. Dep for Kodari (by minibus or van) 5-6 h.Kodari-Zhangmu by minibus/van and if the condition of road is no good,walk upto Zhangmu,Night at Zhangmu or Nylam. 05 Zhangmu-Xagar (4,350m) and Lalung La (5,050m), Night at Xegar. Visit of monastery Tashilump Panchan Lama,Stupa Kumbun & Phalkor Monastere Night at Gyantse. 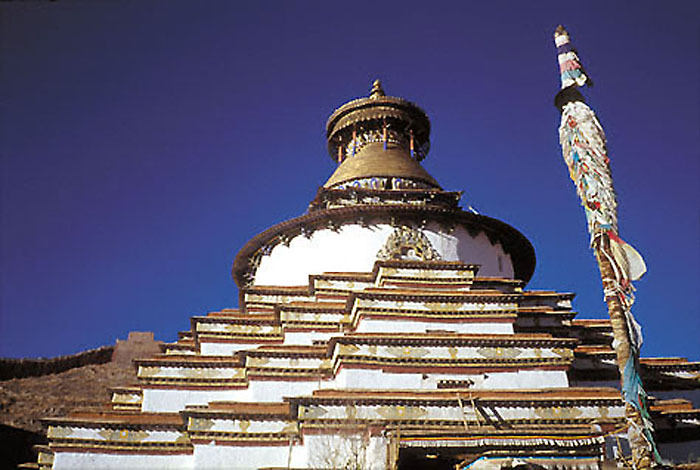 08 Gyantse-Lhasa (3,650m) :261 Km Drive to Lhasa passing through lake Yamdrok. 09-10 Lhasa :2 days visit of Lhasa around,like Jokhang Temple & Barkhor Bazar,Potala Palace,Drepung & Sera Monastery. 11 Airport transfer to Lhasa, and Lhasa-Ktm, by flight pick up and drop to htl in kathmandu. 12. Full day excursion to Nagarkot , to see the beautiful mountain including the Everest. Night at hotel. 13. Transfer to the airport for back to home. Note: The full details of the program by day by day itinerary ,will be provided on your request or after your booking.